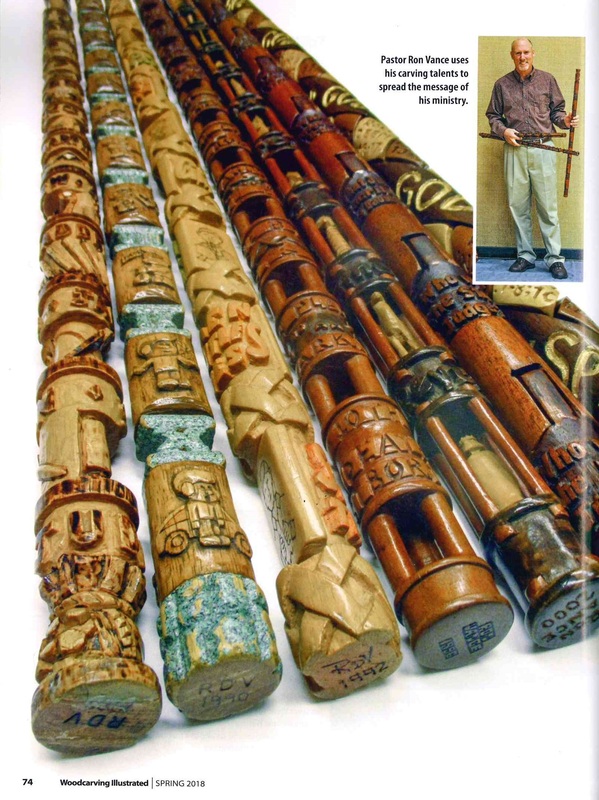 The very first stick I carved was the Camp Stick. I continue to dean that Wilderness Camp at Woodland Lakes Christian Camp in Amelia, Ohio. I continue to carve a new stick every year, listing the names of the kids who come to that week. I have finished 30 years of Wilderness Camp. 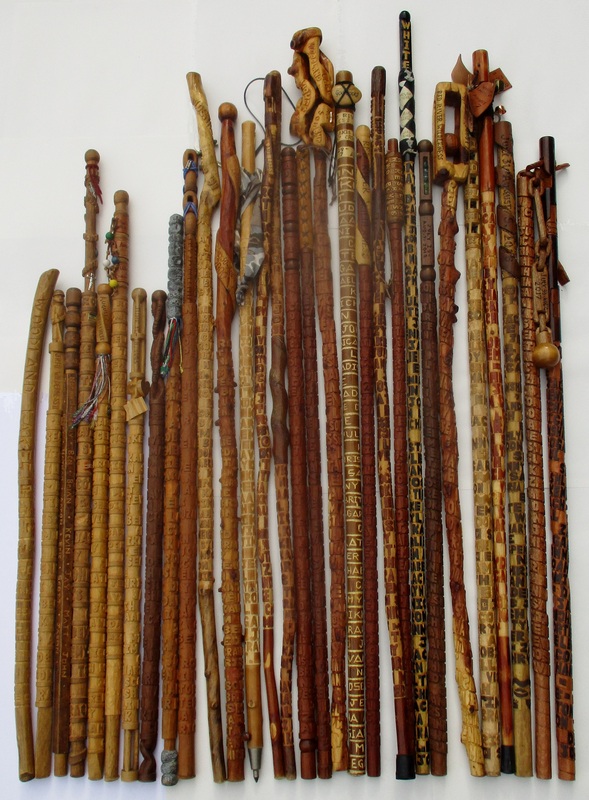 Pictured above are all the camp sticks I have carved. 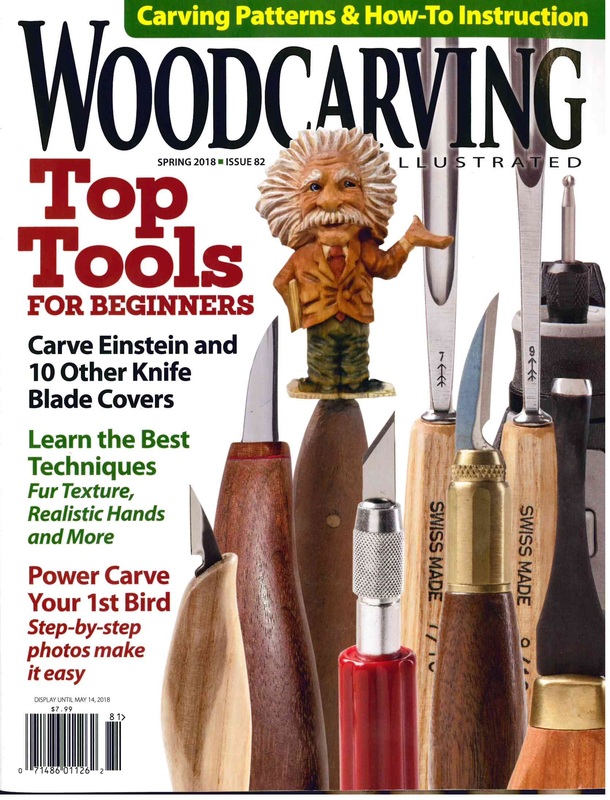 Many people ask what kind of carving knives I use. 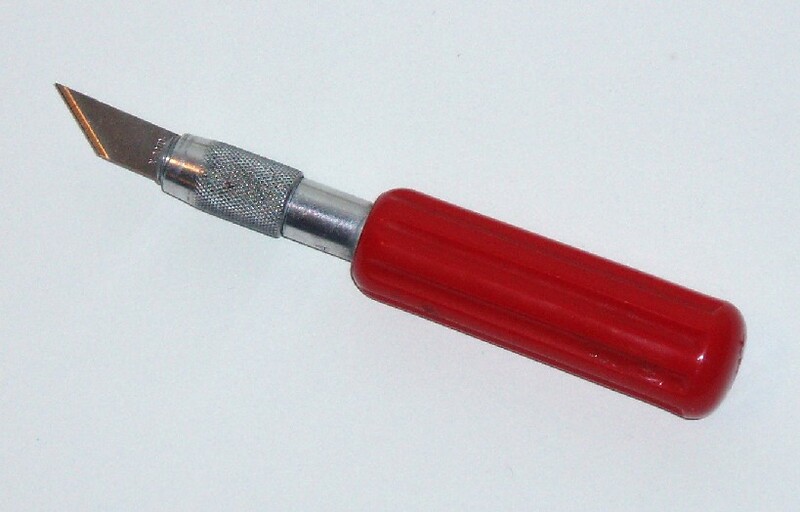 I still use the X-acto knife today. 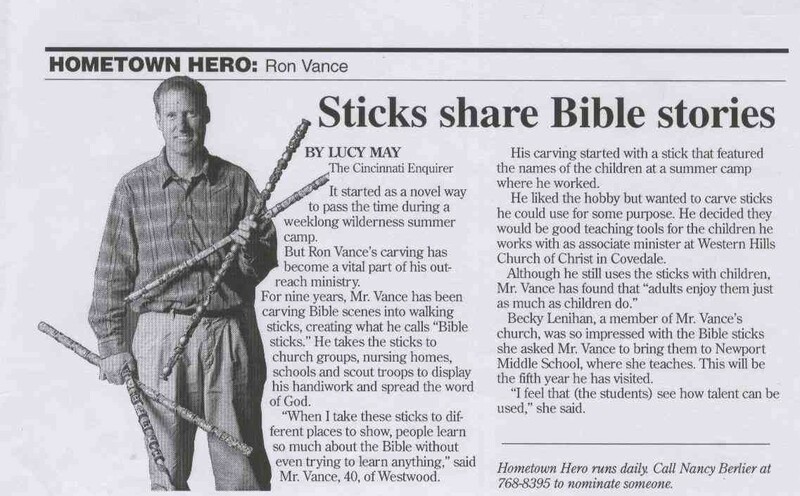 The Cincinnati Enquirer did write an article about the Bible Sticks. 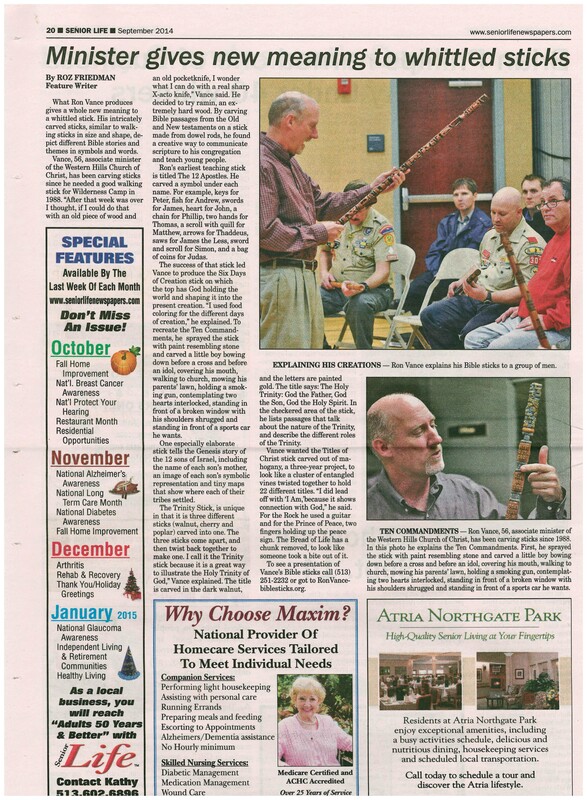 It was featured in a weekly section called “Hometown Hero.” It came out Saturday, February 28, 1998. Plus other articles have been written since then. 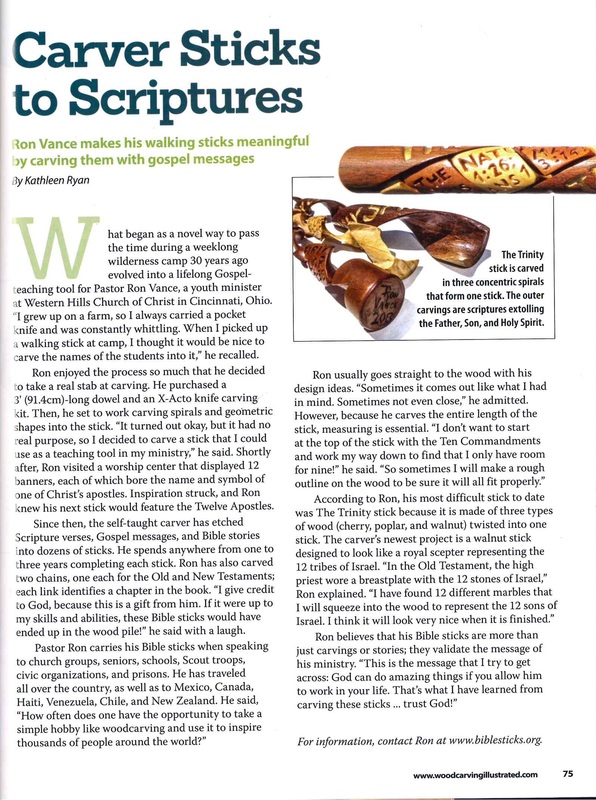 “Woodcarving Illustrated” Spring 2018, featured the Bible Sticks in an article. People have asked if I have done anything else besides wood carving. I started collecting pennies when I was a kid, and still collect pennies today. It hit me one day, I could wallpaper an entire wall in my home with all these pennies. Then I realized I could put in designs because of the different shades of pennies. 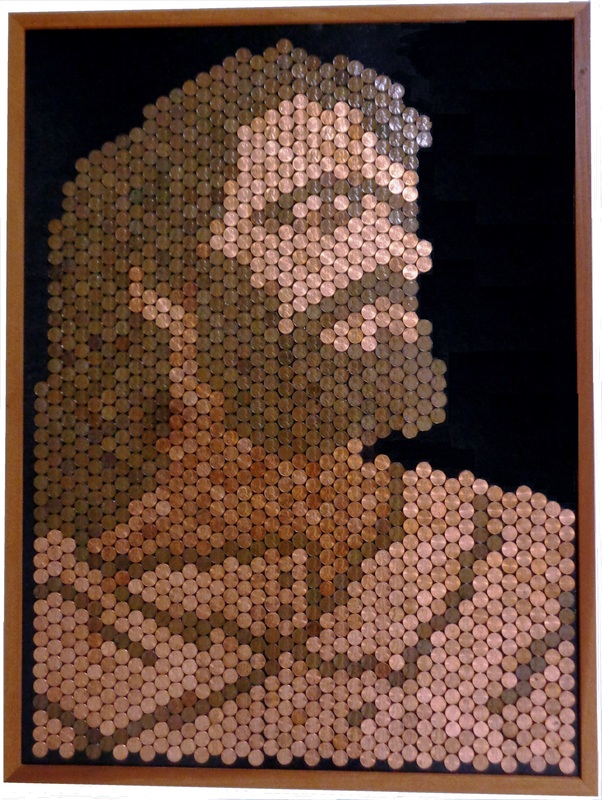 I finally made a picture of Jesus out of pennies. I have taught the young people at our church how to do make these pictures. We have made 13 through the years, giving them as gifts to different churches and organizations. The picture of Jesus is 3 feet tall and has 1300 pennies in it. We also made a map of the world for a Missionary Convention in Cincinnati. 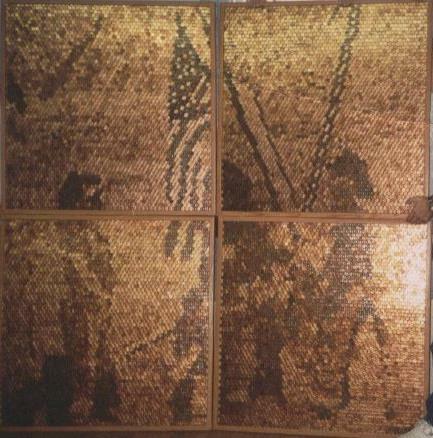 It is 8’x4′, containing 8,316 pennies. We used the new, bright pennies for the oceans and the old, dark pennies for the continents. Finally, I took our young people to New York City, November 2002. We were going to work with one of the churches located in downtown Manhattan, but wanted to do something for the firemen of New York because of the sacrifice they made the previous year, on 9/11. We decided to do something very unique to our church, we made a penny picture of the three firemen raising the flag over ground zero. It is huge! Seven feet tall, seven feet wide. It has 11,700 pennies. We gave it to Engine 4 Ladder 15. They are one of the closest fire stations to where the Twin Towers once stood. They lost 14 men on September 11, 2001. It was one of the most memorable things our young people have ever experienced.